A Delicious snack from gently roasted peanuts in crispy wheat dough cover with a piquant seasoning mixture of Indian curry and chilli lighter touch. PEANUT, WHEAT, mod. CORN starch, sugar, yeast, SOY SAUCE, salt, glucose, meat flavor, garlic, turmeric, onion, chili, pepper, cinnamon, ginger, cumin, nutmeg, cloves, palm oil, maltodextrin, Colours: E100. 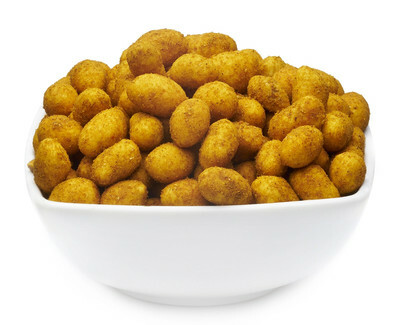 In the CURRY SPICY NUTS we have covered our crunchy peanuts with delicious, Indian curry. The sweet-spicy spice blends wonderfully with gently roasted peanuts inside the crunchy shell and that makes them a wonderful nutty, spicy palate. We think, to a fabulous flavour is included an appropriate appearance: with the golden colours of the curry and tasty wheat shell we award the queen of egg white richest nut varieties of curls a wonderfully majestic appearance. Great taste and healthy snacking to one another are in no contraries in our CURRY SPICY NUTS. The best ingredients and tasty spices are our hobbies since ever. We are always searching for the ultimate taste experience. Curry and peanuts are wonderful partners who blend with each other perfectly. The nutty mild, the kernels and the sweet-spicy curry taste, are coming together in a perfectly nibble experience. The classic among cheese snacks we put under a crispy curry shell so the nutty-sweet aroma of the premium peanuts is finally sealed. Already during the first peanut that you grab with your fingers out of the package, your expectations are fulfilled and the taste comes on your tongue, you will instantly find the delicious taste of curry extremely awesome. Then, if you taste it as the flavour of curry is mixed with the peanut, you have arrived in the middle of India - with all the passion for strong flavours and delightful scents, you feel in your nose when the exotic spice mixture arises in the air, that makes our CURRY SPICY NUTS so unique.